A 2006 Cornell University College of Veterinary Medicine graduate, Dr. Marvin joined the team at Avon Animal Hospital in 2014. Dr. Marvin became the primary owner of the hospital in 2016 when Dr. Warriner semi-retired. She hopes to spend many years serving the needs of the community, their pets, and continuing the tradition of good quality medicine the practice has always offered. Outside the office Dr. Marvin keeps busy with many projects. In nice weather you can most likely find her out and about with her pets or hitting the trails with her horse, Lind. She is a classical pianist and enjoys tinkering around the kitchen in her spare time. Dr. Warriner is a proud Cornell University graduate from the class of 1967. He has served the pet population and their owners in Avon since 1986. He was president of the NYS Veterinary Medical Society (NYSVMS) and Veterinarian of the Year in 2008. He semi-retired in 2016 and is enjoying working part time as a veterinarian. He finds veterinary practice even more enjoyable now and still enjoys caring for the four legged members of the community. He and his wife Diane are active members of the Avon community. They enjoy spending time with their children and grandchildren and hope to find some time for travel. Their cat, Elmo, rules the roost and keeps everyone on their toes. Julie graduated from SUNY Alfred and started at Avon Animal Hospital in 2006. A licensed veterinary technician, Julie, assists throughout the hospital and manages many of day to day things required for hospital operations. The office would not run as smoothly without her. Outside of work she can most likely be found outdoors engaged in finishing some project. She enjoys spending time with her family and they all enjoy camping during the summer months. She can always be found with a faithful canine (dog) companion as her shadow and one of her partners in crime. 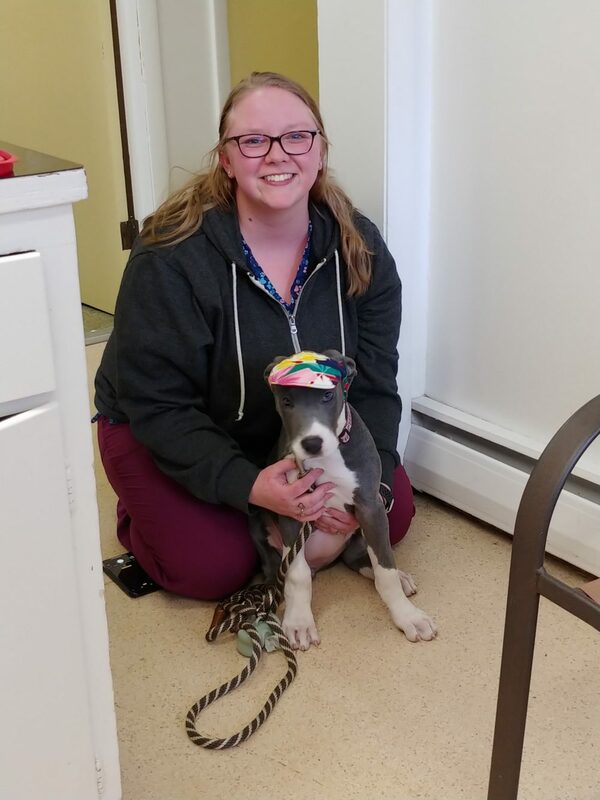 Cortney is a 2018 graduate from Medaille College’s veterinary technician program. She joined the practice during her final year of technician training to obtain the hands on training hours required for her degree. Her personality and love of animals was a perfect fit for our team and she was hired as a permanent member of the animal care team. Her and her husband maintain a very pet friendly home with two kitties and a great dane puppy. In her free time, she enjoys all things crafty and spending time with family. Sarah graduated SUNY Alfred and joined the team in 2012 in order to help us to continue providing good quality medicine and service to our clients. As a licensed veterinary technician, she can be found assisting in many areas of the clinic, but especially enjoys working in the lab evaluating diagnostic samples. A self-proclaimed geek, outside the office she enjoys reading, painting, and video games. Her friendly kitty crew doubles as quite effective watch dogs. Enter her apartment at your own risk of bodily harm! Sharon, a licensed veterinary technician, graduated from SUNY Delhi and works part time as part of the team at Avon Animal Hospital. She fulfills many roles within the hospital and her experience in the veterinary field is invaluable to ensuring we continue to provide the best care to patients. Outside work she enjoys reading, camping, and it is a well-documented fact that she can’t have a “normal” dog. Her current crew are participants in the local dog agility circuit though. Stacey has worked part time as a receptionist at Avon Animal Hospital throughout the years, but returned to regular hours in 2016. Her efficient management of the front desk keep us all organized and running on schedule. She has a soft spot for all things furry and feathered. Outside the office she enjoys gardening and spending time with her family. During the warm weather months you can find her outside or even off camping with her nephews. Mary Ellen joined the practice in 2018. Her diversified background in customer service and animal care enables her to be a versatile part of the team. Her and her musician husband enjoy being active parts of the community. Her house is very animal friendly with a dog, Lizzie, and three permanent “foster” cats from the Livingston County Humane Society. Rob is a preveterinary student who joined the team in 2018. He has plans to attend vet school starting in 2019 and is enjoying getting his feet wet in the day to day aspects of veterinary practice. He is the token guy at the office currently. Outside work you can find him busily studying, student teaching, or joining his family at civil war reenactments. Catherine is a Biology student at SUNY Geneseo on a pre-vet track who joined the team in 2018 to help with general hospital and animal care. In college she is very busy with minors in the honors college and environmental studies. She is also part of the college’s equestrian team. She is looking forward to gaining more animal and veterinary related experience while on her path to veterinary college. Jada joined the animal care team in the fall of 2018. She is actively pursuing a biology degree at SUNY Geneseo and on a pre-vet track. Her studies keep her busy outside of the office, but she enjoys spending time when possible with her “crazy shepherd” Charlie. She is looking forward to learning more about veterinary medicine and all that it entails on her path to veterinary college.